Just before I went to Berlin I wanted to make my mother-in-law Sarah a treat to have while I was away, so what I did was make a large batch of my ginger shortbread recipe and topped it with gooseberries that I’d tossed with some sugar. She loved it. The sour fruits are always good for me, cranberries and rhubarb are two of my favorite. 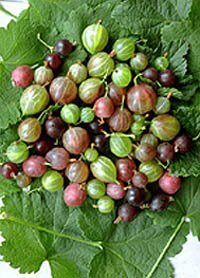 Gooseberries are similar in that they are sour but have a wholly unique flavor. Here’s several options. First the ginger short bread is great just by itself. Second I have made this twice, once with the aforementioned gooseberries and also with peaches. The cooking time varies and with the peaches I finished them off by putting them under the broiler and browning them. The peaches had more juice and took longer before they got to a desirable texture. In the end it was almost like a jam tart only made with fresh fruit and a nice, slightly sugary crust. This recipe makes a large amount – the size of a baking sheet, but it can easily be halved. You could also make it into a tart shell and fill it with fruit of your choosing and bake like a pie. Don’t forget if you do this to add a thickener (I like instant tapioca) if you are using a juicy fruit like peaches or strawberries. In a bowl for a standing mixer (can be done with a hand mixer or by hand, but I love my Hobart standing mixer) add 1 1/2 cups unsalted butter, and process until fluffy. Turn the mixer off and add 1/2 cup organic granulated Sugar and 1/2 cup light Brown Sugar well packed, and 2 T grated fresh ginger. Turn mixer on low and mix until combined. Turn it off again and add 3 cups all purpose flour and 1 cup whole wheat flour, 1/4 teaspoon salt, 2 teaspoons ground ginger and 1/2 cup roughly chopped crystallized ginger (it’s soaked in sugar syrup, they sell it at whole foods, it’s just a softer form of crystallized ginger, and usually comes in cube form, traditional crystallized in a fine substitute). Turn the mixer back on low and incorporate until the dough comes together and is well mixed. It should be on the wet-ish side. Turn out onto a cooking sheet covered with parchment paper (it makes it easier to take off and cool when done, but isn’t essential as the dough is very buttery you can put it directly on the cookie sheet). Using your hands spread the dough out evenly on the sheet. Toss 4 cups of stemmed and cleaned gooseberries or peaches (if peaches chop roughly and use all the juice) add 1/2 cup organic sugar and toss. Spread the fruit over the dough on the cookie sheet. Sprinkle with an additional 1/4 cup of sugar. Place in oven and bake for about 35 minutes. You want the crust to be brown and the juice from the fruit to thickened.